Howard Leventhal was arrested after he tricked Paragon Financial Group Inc. with phony plans to make a Star Trek Tricorder. How would you fancy $800,000? If that piques your interest, you might want to look up the folks at Paragon Financial Group Inc. The only thing you'll need to do is give your favorite sci-fi gizmo a new name and they'll apparently just start handing over checks. 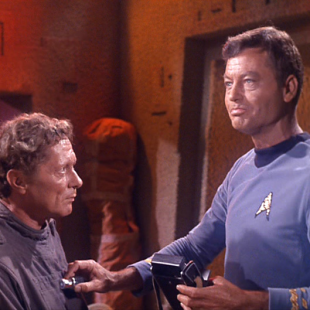 Just ask Howard Leventhal, who recently managed to con the company out of $800K which he was supposed to invest in the "Heltheo McCoy Home Health Tablet," better know as the Tricorder from Star Trek. As amusing as it might seem to think of someone being deceived by this, we'll cut Paragon Financial Group a bit of slack on account of the fact that Leventhal actually put a lot of effort into his ruse. He initially told the company that Health Canada, the Canadian government's department of public health, owed him upwards of $4 million dollars. He also presented them with phony documents including plans for a device "designed as a platform to maximize the patient benefits through broadband-augmented in-home telemedicine" and a forged contract between his company Neovision USA and the Canadian government. "Leventhal claimed to have lucrative connections within the Canadian government and cutting edge technology that could help save lives," said U.S. Attorney Loretta E. Lynch, announcing Leventhal's arrest. Believing the documents to be authentic, Paragon gave Leventhal the aforementioned money. Leventhal was caught when he gave the same forged documents to an undercover agent while trying to obtain another $2.5 million in financing for his bogus invention. He was arrested and then released on bail after posting $100,000 bond. He was then ordered to attend an October 30th hearing where, according to his court appointed lawyer, he intends to contest the charges. While we wait to see how that turns out we'll be busy working on plans to pitch our own invention, a multipurpose cutting device we're calling the Lucas Skywalkian Light Cutter. Somehow we think we might be able to find someone willing to help us out.